Grow Zone Recommendation: As an annual, Browallia will grow in your flower garden in USDA growing zones 2 to 11. It can also be grown as a houseplant. In cooler climates, it’s best to grow them in containers so they can be moved indoors in colder weather. 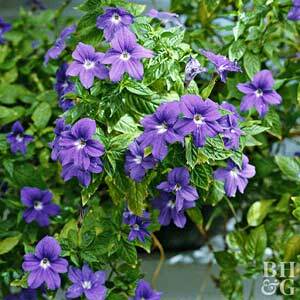 Sunlight Needs: Browallia can be grown in partial sun or shade. Your particular sunlight requirements depend on variety and your particular climate. However, this shade-loving flower will require protection from direct sunlight even when grown in partial sun. Watering Needs: Supplemental watering will be needed for your browallia plants, as they do not tolerate drought. Average Size: Browallia grows 6 to 12 inches wide and 1 to 3 feet tall. Foliage Color: The foliage is emerald green, with jewel-toned blue, purple, or white flowers that bloom in summer and fall. 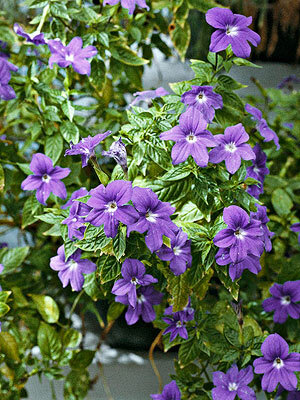 Must Know Plant Care Tips: If you’re looking for flower garden ideas for containers, browallia is an excellent choice. It is easy to maintain and provides bold color for your garden. When planting from seed, begin sowing indoors 8 to 10 weeks before the last frost, with just a little dusting of soil cover the seed. Keep lightly moist in a well-lit spot with diffused (not direct) light. When planting outside, leave at least 12 aches of space between plants. Plant Problem Solver: As long as you protect it from mid-day sun, browallia should be easy to maintain. You can treat your plants against insects with horticultural soap. It will attract pollinating insects like bees and butterflies, so don’t use poisonous insecticides. It will also attract hummingbirds. Protect young browallia from slugs and cutworms that will make a meal of it. You can use a toilet paper roll for this protection on your seedlings. Pinch off spent blooms to keep growth robust. Pretty Pairings: For bold garden color, plant browallia with begonias, sweet potato vine, or impatiens.